The 8th Computer Science On-line Conference 2019 brings together researchers and practitioners (young and experienced) interested in strengthening the scientific foundations in computer science, informatics, and software engineering. CSOC2019 is an environmentally-friendly scientific meeting as all attendees will participate using a web-based conferencing solution. The traditional concepts of scientific conferences are improved by modern communication technology. CSOC2019 uses innovative methodology to allow scientists, postdocs and doctoral students to share their knowledge and ideas on-line. This makes scientific conferencing more environmentally-friendly and ecological as well as more economical for participants too. There are no travel costs or accommodation costs. Participate on-line from your office or home! Prof. Viacheslav Zelentsov, Doctor of Engineering Sciences, Chief Researcher of St.Petersburg Institute for Informatics and Automation of Russian Academy of Sciences (SPIIRAS). Boguslaw Cyganek, Ph.D., DSc, Department of Computer Science, University of Science and Technology, Krakow, Poland. Krzysztof Okarma, Ph.D., DSc, Faculty of Electrical Engineering, West Pomeranian University of Technology, Szczecin, Poland. Monika Bakosova, Ph.D., Associate Professor, Institute of Information Engineering, Automation and Mathematics, Slovak University of Technology, Bratislava, Slovak Republic. Pavel Vaclavek, Ph.D., Associate Professor, Faculty of Electrical Engineering and Communication, Brno University of Technology, Brno, Czech Republic. Miroslaw Ochodek, Ph.D., Faculty of Computing, Poznan University of Technology, Poznan, Poland. Olga Brovkina, Ph.D., Global Change Research Centre Academy of Science of the Czech Republic, Brno, Czech Republic. Elarbi Badidi, Ph.D., College of Information Technology, United Arab Emirates University, Al Ain, United Arab Emirates. Dr. Luis Alberto Morales Rosales, Head of the Master Program in Computer Science, Superior Technological Institute of Misantla, Mexico. Mariana Lobato Baes,M.Sc., Research-Professor, Superior Technological of Libres, Mexico. Abdessattar Chaâri, Professor, Laboratory of Sciences and Techniques of Automatic control and Computer engineering, University of Sfax, Tunisian Republic. Gopal Sakarkar, Shri. Ramdeobaba College of Engineering and Management, Republic of India. V. V. Krishna Maddinala, Assistant Professor, GD Rungta College of Engineering and Technology, Republic of India. Anand N Khobragade, Scientist, Maharashtra Remote Sensing Applications Centre,Republic of India. Intelligent technologies and methods of multi-model forecasting the state and management of complex natural and technological objects; methods and technologies of integrated processing of heterogeneous data, information and knowledge in tasks of monitoring and proactive management; implementation of intelligent information technologies for monitoring and forecasting in decision support systems for managing complex natural and technological objects. 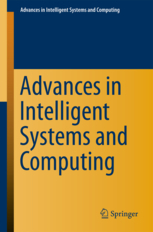 All the accepted papers will be published in the Springer Series: Advances in Intelligent Systems and Computing - ISSN 2194-5357. Corresponding authors will pay a conference fee. The payment process is described here: Payment Description page. All documents can be found in the Download section too. EUR 370,- per accepted paper. The conference fee includes the Springer conference proceedings of the section in which the paper is presented.